MADISON, Wis. — It never feels good to be passed over. If intentions are unappreciated and achievements are undervalued, it’s often enough to make most people pack up and go home. For some, like alternative-rock godfathers Dinosaur Jr., it just makes them try harder. Artistic stubbornness is a trait thoroughly engrained in the Amherst, Mass., trio and borne out in the recurring characteristics of its pummeling music, which combines classic-rock-style guitar fisticuffs with adrenaline-fueled, post-punk rhythms — all showcasing the six-string wizardry of frontman J Mascis. Once heralded by Sonic Youth’s Thurston Moore and others in the late ’80s, the group was forecast as saviors of rock ‘n’ roll only to see one of its acolytes, Nirvana, successfully break through instead. Dinosaur Jr. was destined to be a footnote in rock history. On Tuesday night at the Majestic Theatre in Madison, the original members of Dinosaur Jr. were out to prove they not only deserve a larger entry in the history books, but that this is a band whose sonic ferocity hasn’t been tamed by slights, the passage of time or changing fashion. These guys want respect — both for their legacy and their new album — and they used high decibel levels and their back catalog’s cache of bludgeoning riffs to lay claim to it. To be sure, the music of Dinosaur Jr. can be tough to love. Nirvana’s music launched them to superstardom chiefly because the songs were usually instilled with something the Dinosaur guys just couldn’t be bothered with, namely pop hooks. Like Cream was to the Baby Boomers, these guys were a power trio for Generation X. Dinosaur Jr.’s music was often more about annihilating its listeners and occasionally, each other, with instrumental brawls. As explosive and exciting as the songs were, the sublime choruses the group inserted into select tracks only underscored the extent of Mascis’ and bassist Lou Barlow’s subsumed songwriting smarts and how they obstinately refused to compromise. While the band marveled the rock underground in the late ’80s and early ’90s with their records and fearsome live shows, they were soon hobbled at a critical time by internal friction, particularly escalating tensions between Mascis and Barlow. As Nirvana took off, Dinosaur Jr. was in disarray. Barlow had already been booted from the group and Dinosaur Jr. became just another in a pack of former college-rock bands hoping to advance in Seattle’s wake. They signed to a major label, played Lollapalooza, even had a minor hit video featured on “Beavis And Butthead” in the mid-’90s, but ultimately made increasingly redundant albums. Even a collaboration with My Bloody Valentine recluse Kevin Shields couldn’t forestall the inevitable and Mascis, the sole original member remaining, ended the group in 1998. While they might have missed out on reaching rock’s dizzying heights, the band members waited years before rededicating themselves to finding another kind of musical glory and one more in keeping with their indie credentials. The group’s original lineup reunited in 2005 and, although they’ve now released two new albums, they’ve focused singularly on the road to reclaim their audience and ultimately win back their status. These guys aren’t out to cash in. There’s a grudge they’re nursing. To that end, the group’s current trek in support of new disc, “Farm,” is a string of brutal one-nighters across the U.S. and Canada. And just like the old days, the group is emphasizing core punk values of no-frills musical firepower in its performances even though they’re now traveling in a bus as opposed to a Black Flag-approved van. As such, there was no pageantry when the band unassumingly took to the stage after mulling for several minutes behind the wall of hodgepodge Marshall amps. The musicians exuded quiet confidence as they roared into “Thumb,” a concussive chestnut from the band’s first Barlow-less album, “Green Mind.” Both Barlow and Mascis quickly ditched their oversized glasses as the group’s full force throttled the packed audience. 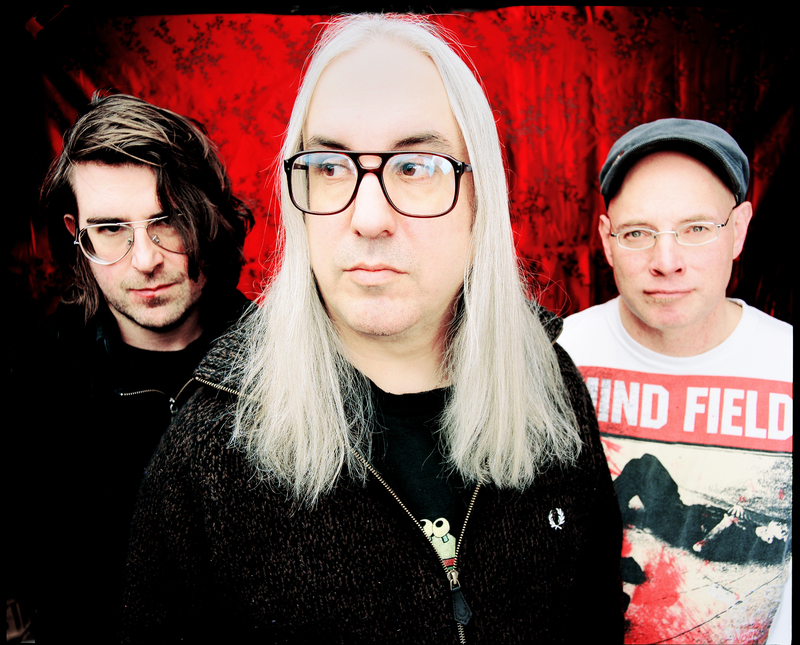 Mascis now sports a shock of long gray hair, but his indistinct yodel hasn’t become clearer or more sonorous over the years. He reserved most of his energy for his guitar, on which he demonstrated a thorough mastery, using the tremolo bar on his Jazzmaster during the song’s bridge to guide the waves of feedback to mimic an undulating pedal steel. “There’s always nothing much to say,” he whined, only to be drowned out by the crushing riffs and the rhythm section’s hard scramble. The trio’s 90-minute set selected nuggets from throughout their discography and including a handful of new songs off “Farm.” They all come from a similar mold: hard-hitting riffs, some garbled vocals and extended squealing solos. And yet, the fierceness of the group’s attack should blunt accusations that they are a one-trick pony. They do what they do very well. Older songs sounded more furious than ever before. The central riff of “Get Me” was a gnarled southern rock lick that bespoke grandeur one might not associated with a powerhouse garage band. Mascis pulled back on the verses to give room to his pleading vocal before thrashing any bleeding hearts with his distorted guitar. Taking a solo, he paused for an instant to scratch his head before diving back into the fray. Likewise, the band turned up the energy on “Feel The Pain,” speeding the choruses to a sprint compared to the rendition on the record. Seemingly unaware of the appreciative crowd in front of him, Mascis unconsciously swayed from side to side behind the microphone. The new songs stumped the audience initially, but typically, once the volume dials crept past 10, the physicality of the music overtook any suspicion. The groove of “Pieces” punched listeners’ ear drums, accented by Masics’ guitar flourishes. The melody was malleable, darting side to side and lunging as it led into a blinding solo. “Imagination Blind” used a Neil Young-style noisy heft to impress. The track was one of two that featured Barlow as lead vocalist, but was also dominated by Mascis’ fretwork. In contrast to these cuts, “Plans,” was beguiling to the audience because of how different it was. It’s a bouncy pop song that offered a moment of placidity during the show. Mascis’ guitar took on a more crystalline quality as he warbled sentiments that were likely romantic. Meanwhile, drummer Patrick “Murph” Murphy pounded out a snappy beat that made this song immediately likeable. Although it won’t ever be a chart single, the song reveals Dinosaur Jr.’s range..
Barlow, who performed double duty as the evening’s opening act with his latest side band, the Missingmen, embodied cathartic energy all night. He tore at the neck of his bass in a seemingly haphazard manner. More mercurial and talkative than the glacially languid Mascis, Barlow hovered near the microphone in between songs ready to engage in a little banter, but was constantly if unintentionally interrupted as Mascis noodled and ran through an assortment of Rolling Stones and Kinks licks. Whether any tensions remain between the pair is unknown, though the band’s attempts to blow the crowd out of the theater allowed the musicians to vent frustration. Fan favorite “Freak Scene” flowered in a haze of distortion with Mascis deploying a soaring guitar effect that brilliantly reproduced Jimi Hendrix’s psychedelic soundscapes. And it was during “Freak Scene” that the overly polite crowd of graying Generation X-ers were finally roused from suburban slumber by this troupe of 40-something ex-punks and began to mosh like it was 1993. Returning for an encore, the group took a request for “Bulbs Of Passion” and returned the favor by mauling the now-rowdy audience members with more savage guitar rage. The three-piece quietly recoiled during the verses before rushing forward during the choruses. They weaved the music between influences ranging from Led Zeppelin’s “Immigrant Song” to prog-rock before letting another solo guide anyone who could hear back to safety. They concluded with their trademark cover of the Cure’s “Just Like Heaven” and during those 90 minutes, it might have passed for Dinosaur Jr.’s version of it rock heaven. The band restated what needed to be said about Dinosaur Jr.’s place in music history and made their case using the loudest implements it could muster. Of course, the response they got was nothing but affirmation. After all, the band was preaching to the choir. Try as they might, Dinosaur Jr. will never live down what happened in the early ’90s when the definitive moment passed them by. They were better off to have missed it. Music like theirs is often overlooked in favor of commercial interests. It didn’t mean Dinosaur Jr.’s music didn’t matter. Just ask the remaining guys in Nirvana. Friday, Oct. 16, Louisville, Ky.
Sunday, Oct. 25, Oklahoma City, Okla.
Monday, Oct. 26, Kansas City, Mo. Tuesday, Oct. 27, Omaha, Neb. Thursday, Oct. 29, Boulder, Colo.
Friday, Oct. 30, Fort Collins, Colo.
Tuesday, Nov. 3, Tempe, Ariz.
Wednesday, Nov. 4, Solana Beach, Calif.
Saturday, Nov. 7, Portland, Ore. Tags: Dinosaur Jr., J Mascis, Lou Barlow, Madison, Majestic Theatre, Murph, review, Wisconsin. Bookmark the permalink.